Individual Prophecies referred to as Horoscopes, Readings and Divination are older than the Dead Sea Scrolls but have only been published in Astro-Psychometric language since the time of Carl Jung. 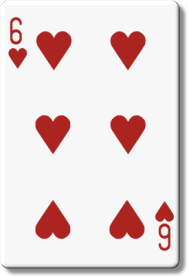 Each day of the year is given a card that relates to their personality type, as luck or fate, Trump chose the most challenged one in the deck, the THREE of Diamonds. The snippet that follows is from the Yearly Spread of a June 14, 1946 birthday. The scroll (script), reading, horoscope and divination is the same for all twelve THREE of Diamonds months for ages 27 + 45 = 72 in Trump's case. Trump at 29 with Fred staying at Donald's first five star hotel. Bernie, Che Guevara, Trump and George Washington all share 3 of Diamonds birthdays and therefore at the age of 27 faced their personal challenges as described below. Che and Washington never made it to 72. Five years ago when Bernie was 72 he used this script to win reelection to the Senate with 71% of the vote. At 27 George was appointed to lead the Continental Army and Che signed up with Fidel Castro to overthrow Batista. The Jupiter Period 17 Nov to 9 Jan 2019 is the one that falls in the middle of your personal year. During this period, the focus is usually on business and financial matters, though it is not restricted to these alone. The two cards found in this period will combine to tell you what influences are present and therefore, what is likely to occur. Our Jupiter Cards often tell us what or who are the biggest blessings of the year, especially along financial lines. If we involve ourselves in activities related to our Jupiter Cards, we could see an increase in our finances through those directions. The cards below are from your Birth (Self) Card's Yearly Spread. Therefore, they are some of the more important Jupiter Cards of the year and will apply specifically to the areas of your life and personality that are represented by this card. Financial and other blessings will come as the result of your mastery over your own feelings, and the ability to communicate with charm and grace with those in your business and home. You have much 'love power' at your disposal. See that you use it wisely. Your ability to handle others may astound you during this period. For men, this is a possible indication of the birth of a child this year. If so, it will be a blessed one. Any men of the Hearts suit could be a source of financial and other blessings this year, especially those who are older or who are in a leadership role in their work. During this period it is likely that you will be receiving some good 'Love Karma' for having done good for others in the past. Past efforts to take responsibility and willingness to make compromises in love and friendship, are now bearing fruit as others come into your life to repay you in some fashion. Maintaining your composure and resting in the knowledge that 'as you give, so shall you receive', you are in the happy harvest time of peace and domestic harmony. It's deja vue, all over again for Trump in Jupiter this year. 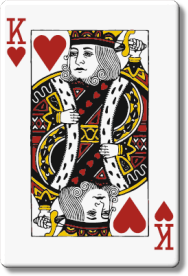 He has the KING of Hearts "The Master of Love" card, the Jackie Kennedy, Brad Pitt, Joe Biden birth card. Trump knows he is on top, so schmoozing the Democrats to get things (anything) done is the way he is going - the fortune is with him.